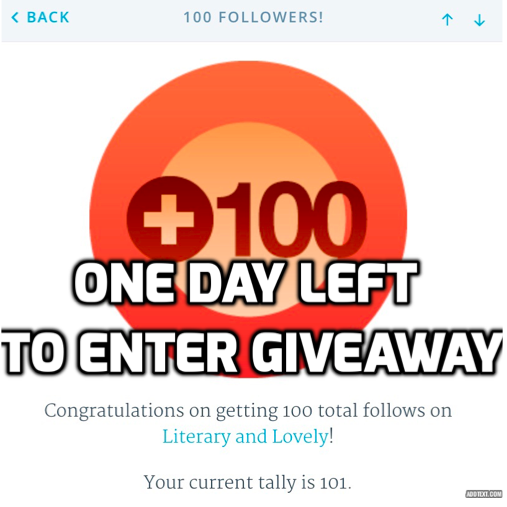 I just wanted to quickly announce that today is the last day for you or any of your friends to enter my 100 followers giveaway!!! I have one last quick thing to say. Many people have only completed a portion of the entrance requirements of the giveaway, so please double-check that you have completed all three parts in order to be entered in to this giveaway. I don’t want to leave anyone out!!! The winner will be randomly selected on October 1st, 2015, and will be contacted via email regarding the lipstick shade and book they would like. Please note that the winner will need to provide shipping information so the items may be sent to them, but it will remain confidential, and will be destroyed once the items are sent off. The winner will be announced on this blog in a congratulatory post, and I will also announce when the next giveaway will be held. 100 Followers Giveaway: And the Winner is . . .